Phineas Gage is often referred to as one of the most famous patients in neuroscience. He suffered a traumatic brain injury when an iron rod was driven through his entire skull, destroying much of his frontal lobe. Gage miraculously survived the accident but was so changed as a result that many of his friends described him as an almost different man entirely. On September 13, 1848, the then 25-year-old Gage was working as the foreman of a crew preparing a railroad bed near Cavendish, Vermont. He was using an iron tamping rod to pack explosive powder into a hole. Unfortunately, the powder detonated, sending the 43 inches long and 1.25-inch diameter rod hurtling upward. The rod penetrated Gage's left cheek, tore through his brain, and exited his skull before landing 80 feet away. "I first noticed the wound upon the head before I alighted from my carriage, the pulsations of the brain being very distinct. Mr. Gage, during the time I was examining this wound, was relating the manner in which he was injured to the bystanders. I did not believe Mr. Gage's statement at that time, but thought he was deceived. Mr. Gage persisted in saying that the bar went through his head… Mr. G. got up and vomited; the effort of vomiting pressed out about half a teacupful of the brain, which fell upon the floor." Soon after, Dr. John Martyn Harlow took over the case. It is through Harlow's observations of the injury and his later descriptions of Gage's mental changes that provide much of the primary information that we now know about the case. Harlow described the initial aftermath of the accident as "literally one gore of blood." Later in a published description of the case, Harlow wrote that Gage was still conscious later that evening and was able to recount the names of his co-workers. Gage even suggested that he didn't wish to see his friends since he would be back to work in "a day or two" anyway. After developing an infection, Gage then spent September 23 to October 3 in a semi-comatose state. On October 7, he took his first steps out of bed and by October 11 his intellectual functioning began to improve. Harlow noted that Gage knew how much time had passed since the accident and remembered clearly how the accident occurred, but had difficulty estimating size and amounts of money. Within a month, Gage was even venturing out of the house and into the street. In the months that followed, Gage returned to his parent's home in New Hampshire to recuperate. When Harlow saw Gage again the following year, the doctor noted that while Gage had lost vision in his eye and was left with obvious scars from the accident, he was in good physical health and appeared recovered. Unable to return to his railroad job, Gage held a series of jobs including work in a livery stable, a stagecoach driver in Chile, and farm work in California. Popular reports of Gage often depict him as a hardworking, pleasant man prior to the accident. Post-accident, these reports describe him as a changed man, suggesting that the injury had transformed him into a surly, aggressive drunkard who was unable to hold down a job. So was Gage's personality as changed as some of the reports after his death have claimed? Evidence suggests that many of the supposed effects of the accident may have been exaggerated and that he was actually far more functional than previously reported. "Previous to his injury, although untrained in the schools, he possessed a well-balanced mind, and was looked upon by those who knew him as a shrewd, smart businessman, very energetic and persistent in executing all his plans of operation. In this regard his mind was radically changed, so decidedly that his friends and acquaintances said he was 'no longer Gage.'" Since there is little direct evidence of the exact extent of Gage's injuries aside from Harlow's report, it is difficult to know exactly how severely his brain was damaged. Harlow's accounts suggest that the injury did lead to a loss of social inhibition, leading Gage to behave in ways that were seen as inappropriate. How Severe Was Phineas Gage's Brain Damage? In a 1994 study, researchers utilized neuroimaging techniques to reconstruct Gage's skull and determine the exact placement of the injury. Their findings indicate that he suffered injuries to both the left and right prefrontal cortices, which would result in problems with emotional processing and rational decision-making. Another study conducted in 2004 that involved using three-dimensional, computer-aided reconstruction to analyze the extent of Gage's injury found that the effects were limited to the left frontal lobe. In 2012, new research estimated that the iron rod destroyed approximately 11 percent of the white matter in Gage's frontal lobe and 4 percent of his cerebral cortex. Gage's case had a tremendous influence on early neurology. The specific changes observed in his behavior pointed to emerging theories about the localization of brain function, or the idea that certain functions are associated with specific areas of the brain. Today, scientists better understand the role that the frontal cortex has to play in important higher-order functions such as reasoning, language, and social cognition. In those years, while neurology was in its infancy, Gage's extraordinary story served as one of the first sources of evidence that the frontal lobe was involved in personality. What Happened to Phineas Gage? After the accident, Gage was unable to return to his previous job. According to Harlow, Gage spent some time traveling through New England and Europe with his tamping iron in order to earn money, supposedly even appearing in the Barnum American Museum in New York. He worked briefly at a livery stable in New Hampshire and then spent seven years as a stagecoach driver in Chile. He eventually moved to San Francisco to live with his mother as his health deteriorated. After suffering a series of epileptic seizures, Gage died on May 20, 1860, almost 13 years after his accident. Seven years later, Gage's body was exhumed and his skull and the tamping rod were taken to Dr. Harlow. Today, both can be seen at the Harvard University School of Medicine. Costandi, M. (2012). Phineas Gage's connectome. The Guardian. Harlow J. M. (1848). Passage of an iron rod through the head. Boston Medical and Surgical Journal, 39, 389–393. Harlow, J. M. (1868). Recovery after Severe Injury to the Head. Bulletin of the Massachusetts Medical Society. Reprinted in History of Psychiatry, 4(14), 274-281 (1993) doi:10.1177/0957154X9300401407. Twomey, S. (2010). 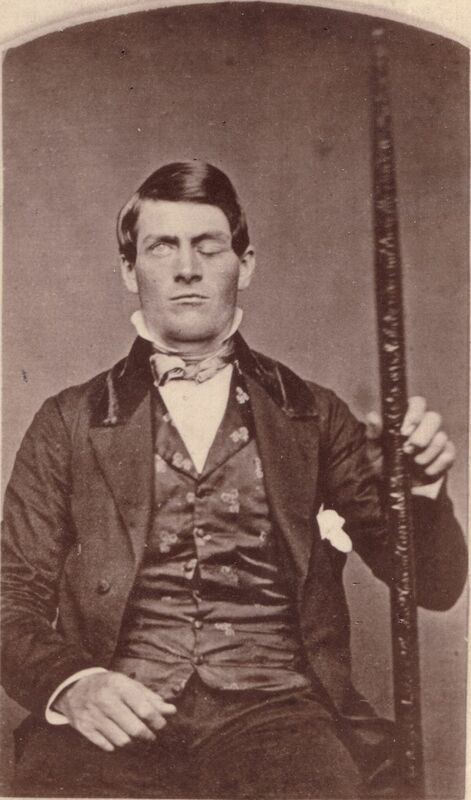 Phineas Gage: Neuroscience's Most Famous Patient. Smithsonian Magazine. Van Horn, J. D., et al. (2012). Mapping Connectivity Damage in the Case of Phineas Gage. PLoS ONE, 7(5), e37454. DOI: 10.1371/journal.pone.0037454. What Was the Little Albert Experiment? Why Was Sergei Pankejeff Known as the Wolf Man?